Ram recently debuted the all-new heavy-duty pickup trucks following the redesign of the light-duty Ram 1500 in early 2018. 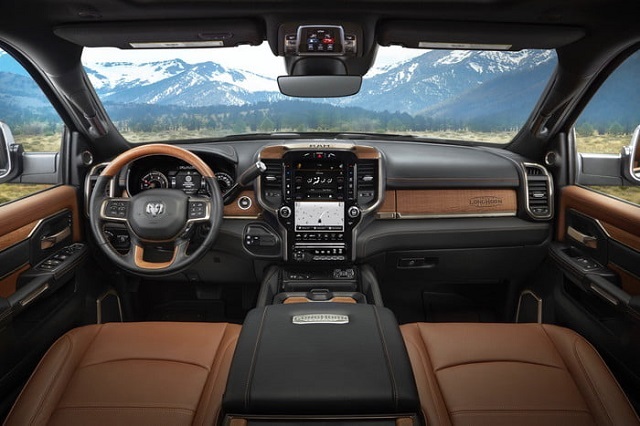 With the Ram HD new inside, out and under the skin, buyers have now the most refined and capable Ram trucks ever and there are also loads of modern tech and comfort features. But what is the most important, the new Ram HD truck provide the class-leading towing capability and the brand is first to reach the milestone of 1000 lb-ft of torque with the upgraded Cummins inline-6 turbodiesel engine. So, the buyers who need the towing over 15, 000 lbs and many do, should consider the Ram HD truck and the three-quarter-ton Ram 2500 is first in line with the towing limit close to 20, 000 lbs. To tow that much the 2020 Ram 2500 Diesel version is needed while for an even greater capability over 35, 000 lbs Ram 3500 must enter the game. Ram redesigned recently the HD truck series and the new-generation versions are new from the ground up. In order to lift the capability of the trucks, Ram started from the structural upgrades while upgraded the range of engines. The powertrains remain familiar but Ram reworked engines to provide new levels of capability and efficiency and the improved Cummins inline-6 diesel is currently the most torque capable engine in the class and first reached the magical number of 1, 000 lb-ft. The new generation Cummins I6 keeps the same displacement of 6.7 liters but received the heavily reworked design. The new version has a new cylinder block and weighs 60 lbs less than before. The new design includes also an improved cast-iron cylinder head and stronger but lighter pistons. The upgraded variable geometry turbocharger and new exhaust system play also the role in the class-leading performance. The standard Cummins inline-6 diesel will be available in the 2020 Ram 2500 Diesel and larger 3500 version. In this configuration, the engine provides 370 hp at 2, 800 rpm and peak torque of 850 lb-ft at 1, 700 rpm. The standard-output Cummins turbodiesel comes in the mix with the improved 68RFE six-speed automatic transmission. 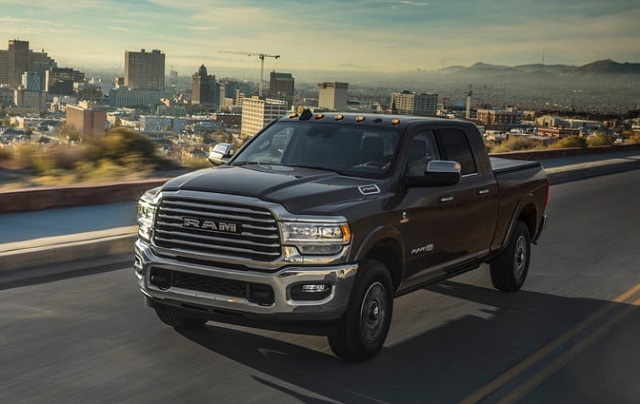 The Ram 3500 will be available with the more capable 6.7-liter inline -6 engine with the power and torque ratings at 400 hp and 1, 000 lb-ft respectively. In this case, the engine is paired with the heavy-duty Aisin 6-speed automatic transmission. The truck will come with the 3.73 axle ratios and rear- or four-wheel drive configurations. Thanks to the upgraded structure, engine capability and available tow packages, the truck will provide the impressive towing capability. The Ram 2500 will allow up to 19, 780 pounds of towing. The diesel-powered Ram 2500 will be able of carrying 3, 250 pounds in the cargo bed. The Ram 3500 in an appropriate configuration and with the 1,000 lb-ft Cummins engine will provide the towing up to 35, 100 pounds. Ram improved the structure of the new HD models greatly and changed also the visual identity of the new generation models. The 2020 Ram 2500 Diesel and other versions have a new chassis made from 98.5 percent high-strength steel. The frame includes six crossmembers and fully boxed rear rails. With the new frame and aluminum hood, the truck measures 143 pounds less. The look of the model is also reworked with the cues from the previously redesigned Ram 1500 but the HD model has a stronger presence. The model uses new grille and headlights design and the style of the grille depends on the trim level but the crosshair design is gone. The rear has also special treatment depending on the trim version and new headlights. Inside the cabin, the truck stays in similar dimensions as the previous generation and the Mega Cab style provides 43.1 inches of the rear legroom. The new HD Rams come also with more interior refinement and available tech than ever. The models will be available with the variety of material quality and options as well as the color combinations. The truck will offer the full leather upholstery and wood trim details but the less costly and durable options as well. There will also be plenty of storage compartments including a large center console. The latest tech features will also be at disposal in a number of options. The model will offer the latest and praised Uconnect system with the smartphone compatibility and touchscreen options including the large 12.0-inch unit. The safety of the trucks will also be well guarded with the newly introduced active safety systems. The Ram HD will rely on the adaptive cruise control, automatic emergency braking, parking sensors, blind spot monitoring, active lane control, etc. The 2020 Ram 2500 Diesel will be available in the second part of the year. The price will likely see the modest increase compared to the current version considering extensive upgrades.